The Impact Site (遭難地点?, lit. : "Impact Point") is where Captain Olimar first lands after his ship crashes on PNF-404 in Pikmin, and so the first day is spent there. 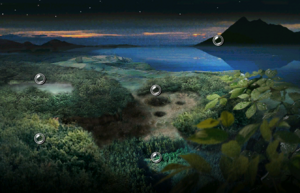 The area is near the edge of the vast forest on the area select map, not far from The Forest of Hope. The Impact Site is the location of the discovery of the Red Onion with its associated Red Pikmin. This area and The Final Trial make up the Wistful Wild in Pikmin 2. Because of its size and few ship parts, this area is one of the least visited in a regular playthrough, but is also the best one to increase Pikmin population in. Olimar first crashes here on day 1, with the entirety of the day taking place here. Here, Olimar first meets the Red Pikmin, and with their assistance, is able to collect his first ship part, his missing ship engine. Later in the game, after Blue Pikmin have been obtained, Olimar returns here to retrieve the Positron Generator, which is found in the mouth of a Pearly Clamclamp surrounded by water. This area features lush green grass terrain and natural environments, giving it a forest-like vibe. The level consists of a small pool of water that is not accessible on day 1, a number of tree stumps, and a few relatively small grassy clearings. It is not very large in size, since it is mostly meant to teach the player how the game works. The main defining parts of the area are quite open, but the paths between them are very narrow, which helps split the area into well-defined sections. This, combined with the area progression's linear nature, makes it an easy level to navigate. 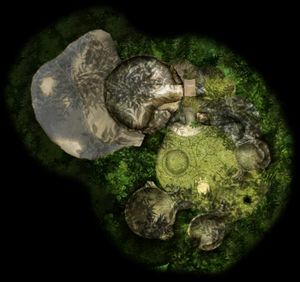 Even so, it manages to incorporate slanted terrain and a fair amount of vertical variation, which helps the player understand that the ground is not flat all the time. The Impact Site contains only two ship parts, one of which is collected on the first day in the tutorial-like beginning of the game. After day 1, the amount of Pellet Posies increases, and some enemies appear: the large amounts of pellets from then on make this area arguably the best place for boosting Pikmin population. 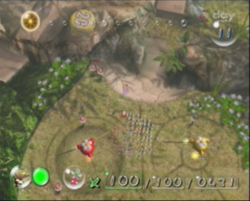 The only hazard in the area is water, but it cannot be reached on day 1, which stops the player from having Pikmin killed before they are ready to understand the consequences. There are two main sections to this area: the grassy plain where Olimar lands, to the south, and the beach section with a large tree trunk to the north. To reach the trunk, the player must first push the cardboard box out of the way on day 1. Reaching the beach requires breaking a stone wall, with the help of Yellow Pikmin. Starting on day 8, the large tree stump near the water becomes the only location of the Goolix and the Mamuta in this game, with the former being found on odd-numbered days, and the latter on even-numbered days. To note is that the Pellet Posies, Pearly Clamclamps, and Iridescent Flint Beetles will be there every day. The highest amount of Pikmin one could raise in The Impact Site in one day is 301 (unless one were to hit the Flint Beetles more than eight times – hitting each nine times would produce 307, hitting each one twelve times would produce 322 – but this is highly unlikely). This is the landing site for the area. The terrain is quite open and flat, except for the tree stumps that have small paths curving upwards, some higher tree stumps that cannot be reached, and one or two higher ledges that help show the importance of throwing Pikmin. There are a few Pellet Posies here, as well as a 10 pellet of each color on the large stump. To the north, this area connects to the Main Engine room, but is initially blocked off by a cardboard box. This is the small area that holds the Main Engine. It is quite crowded and small, serving mostly to suggest the importance of navigating an area and of utilizing the objects scattered around for the player's advantage. There is a ramp at the center of this room that can be used to access the stump arena, after the cardboard box has been pushed to create a bridge. On later days bomb rocks can be found inside the box, which may be used to destroy the reinforced wall with the help of Yellow Pikmin. This large open stump is where the player fights either the Goolix or the Mamuta, depending on the day. It has walls stopping the player from walking out of it, except to the east, where the access cardboard box is, and to the west, where there is a reinforced wall leading to the pond. Some of the walls surrounding the arena have high ledges with pellets on them. This section has a beach and a large pond. The beach connects all the way to the south, where it curves and leads back down to the crash site, although it is blocked by a white bramble gate. This is a one-way path, since the beach is at a higher level. This section houses three Pearly Clamclamps, as well as a red 20 pellet and a blue 20 pellet. One of the Clamclamps also holds the Positron Generator, and must be defeated in order to obtain it. The landing zone of The Impact Site. The Impact Site in Challenge Mode (Japanese version). The area around the landing zone. The first Iridescent Flint Beetle in the area. The second Flint Beetle and the location of the bomb-rocks. The main tree stump, with a Goolix. Entrance to the watery portion. Back exit from the pond. Preview image on the area selection menu. Captain Olimar discovers Red Pikmin (demo image). Fan-made map of the area in Challenge Mode. An early overview of part of The Impact Site. The textures for this image are loaded on the game itself, but go unused. The radar pattern for The Impact Site. Strangely, a Bulborb can be seen during the end of day cutscene, even though no Bulborbs are present in the actual area. In the New Play Control! version, the white gate leading to the beach with the Clamclamps can be broken down on day 1 by throwing Pikmin onto the ledge as far as possible and getting onto the stump. The Impact Site is one of two areas with an optional boss, the other being The Distant Spring. In Pikmin 3, Alph's crash site's theme takes inspiration from The Impact Site's theme, as does the most common Bingo Battle theme. The tutorial stage theme from Pikmin Adventure is also based on The Impact Site's music. This article was a featured article from February 1st, 2019 to April 2nd, 2019. This page was last edited on April 2, 2019, at 16:28.